Roaring Rockets! On July 16, 1969, Apollo 11 was launched into orbit. This mission allowed the first humans to set foot on the moon, established the United States as a leader in space innovation and exploration, and changed the world forever. Commander Neil Armstrong’s “giant leap for mankind” would not have been possible without the Kennedy Space Center. Construction of the Kennedy Space Center began in 1962 to fulfill President John F. Kennedy’s goal of expanding lunar launch operations. Located in sunny Brevard County, Florida, the new Launch Operations Center was built on Merritt Island, adjacent to existing missile launch facilities at Cape Canaveral. The entire area was renamed Cape Kennedy a week after President Kennedy was assassinated in 1963, but this decision was unpopular with the people living in Cape Canaveral and Port Canaveral. In 1973 the facility was renamed as it is known today: The John F. Kennedy Space Center at Cape Canaveral. After the success of Apollo 11, numerous other spacecrafts launched from the Kennedy Space Center, including the first joint United States-Soviet Union spaceflight in 1975. In more recent years, all five space shuttles—Challenger, Columbia, Discovery, Endeavor, and Atlantis—were launched from the Kennedy Space Center for a grand total of 135 missions. The Kennedy Space Center has played an important role in space travel for the past few decades, and now you can experience the thrill and history, too! The museum is broken into different “mission zones” and offers something for everyone. Visitors can see the shuttle Atlantis on display as it appeared to the astronauts in space; pay their respects to legendary astronauts like Neil Armstrong, Buzz Aldrin, and Sally Ride in the Astronaut Hall of Fame; or stroll through the rocket garden. Bus tours run throughout the day, offering behind-the-scenes glimpses into the central launch complex, the vehicle assembly building, or the Kennedy Space Center headquarters. For history buffs, there is a mission zone dedicated to the tense and exciting “space race” with the Soviet Union in the 1960s, with additional exhibits commemorating the launch of Apollo 8 and the moon landing. Intrepid thrill-seekers can participate in an astronaut training simulation and a shuttle launch experience which allow them to truly feel firsthand what it’s like to be an astronaut in space! 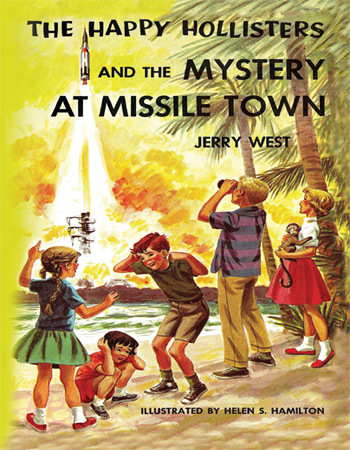 In preparation for your visit to the Kennedy Space Center, we recommend reading The Happy Hollisters and the Mystery at Missile Town by Jerry West. Written in 1961, this exciting mystery for young readers conveys the budding sense of wonder that children all over the U.S. were experiencing as space travel made the jump from dream to reality. Paperback; 174 pages with 19 illustrations. Only $9.95!